Aggregate metrics are at the top of the page showing the overall metrics for all campaigns. Campaign tiles for all your campaigns are center stage. The tiles show important information for each campaign, including metrics, status, segments, and more. Campaign status filters are in the top left panel. This is where you can easily access subsets of your campaigns grouped by status. Campaign group filters are in the bottom left panel. This is where you can create new campaign groups or filter the page down to just those in a specific (or no) campaign group. The aggregate metrics section shows you a summation of all campaign metrics, including open and click rate, conversions, and revenue. These metrics will change based on the campaign status or group filter applied in the left panel, giving you a high-level overview of the campaigns you're viewing. The description in the top left corner of the aggregate metrics tile tells you the campaign status or group filter that you have applied to the page. If you haven't selected a filter, the description in the top left corner will say "All." If you have selected a campaign group filter, there will be a Group Settings button below the campaign group name in the aggregate metrics section. Click this button to edit your campaign group settings. The campaign tiles will show you the metrics for each individual campaign. Use the blue dots below the metrics in the aggregate metrics section to change pages to see more metrics! All: No filter is applied. This is the default, so each time you come to the Campaigns page, you will see all of your campaigns. Drafts: Filtered to only campaigns with a status of Draft. By definition, only campaigns that have never sent before can have a Draft status. Active: Filtered to only campaigns that are scheduled to send in the future or are actively sending at this moment. This includes Scheduled, Preparing, Running, and Ongoing. Paused: Filtered to only campaigns with a status of Paused. Completed: Filtered to only campaigns with a status of Completed. One-time campaigns are automatically marked completed. Ongoing (recurring and continuous) campaigns can be marked completed when you pause them. The number next to each status shows how many campaigns currently have that status. Selecting a status filter will force the aggregate metrics to be calculated using only the campaigns in that status. 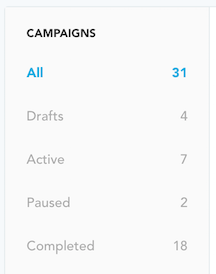 So, for example, you'll be able to easily see how all of your completed campaigns are performing in aggregate! When you want to get back to the complete, unfiltered list of campaigns, simply click the "All" filter, and the page will remove the applied filter. Campaign group filters allow you to view the campaigns within a particular campaign group that you have created. The New Group button will start the process of creating a new campaign group. You'll be able to give the group a name, specify whether it's a Normal or Priority group, and set up the schedule. Once created, you can edit the campaign group setup using the Group Settings button in the aggregate metrics section. 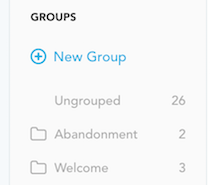 By selecting Ungrouped, you'll be able to filter the page to all campaigns that are not associated with a group. You can select any campaign group by name to filter the page to just the campaigns in that group. Next to the campaign group name, the number shows how many campaigns have been created within that campaign group. Selecting a campaign group will force the aggregate metrics to be calculated using only the campaigns in the specified group.